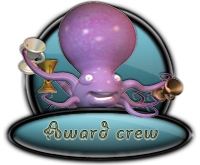 The Elfpack Awards Crew are the people who monitor over the Elfpack Awards and make sure everything is in order and working correctly. They update the pages, post the polls and winners and make sure no one cheats. They also answer any questions you may have about the Elfpack Awards. 2012-02-02 [sammie h! ]: This needs to be Only editable by the Cult I think? The pink text is kind of annoying..
2012-08-10 [Cerulean Sins]: I don't think so.